The beautiful brown eyes of my children glaze over when I string together more than a few sentences that do not end with the words, “do you want something to eat?” So, this is the perfect place for me to express myself about farmhaven, growing children, growing and selling food and flowers and yes, of course, eating. Blogging is cheaper than therapy too! Be warned, I am half Sicilian and love food. I love to eat it, read about it and watch it being prepared on TV. One of my personal goals this year is to get my kids to eat more vegetables, especially if we are growing them. They tend to like their vegetables the way they like their donuts, fried. Fried okra, fried zucchini, fried squash, fried eggplant, fried mushrooms, fried potatoes, fried pickles, fried jalapano peppers. Ok, vegetables are really, really good battered up, golden and crunchy on the outside and soft and extra tasty on the inside. Sprinkle them with a little salt and pepper while hot and they are better than good, they are delicious. I find the only way to stop my children from eating too many fried vegetables for dinner is to constantly taste-test them during the cooking process. Portion control is important, I read about it all the time in my cookbooks. Frying is delicious but infrequent at our house. I save it for special occasions because it is so messy. If my mom is reading this, she stopped at messy – it should be my middle name, but in my defense I do like a clean kitchen and I don’t have a deep-fryer. I haul out the ancient, black, cast iron skillets that weigh a ton. These skillets are artifacts from another time in the kitchen. They can be found at goodwill, yard sales and if you’re lucky, at the bottom of your cabinet. 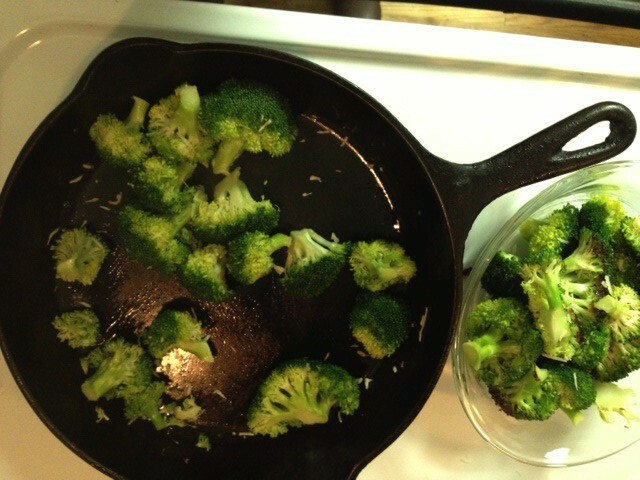 My boys like fresh broccoli cooked in a cast iron skillet. Heat a little bit of olive oil in the pan, and then add the cleaned, cut florets. Stir until the broccoli turns bright green and season to taste with salt, pepper and, if you’ve got it, some good parmesan cheese.